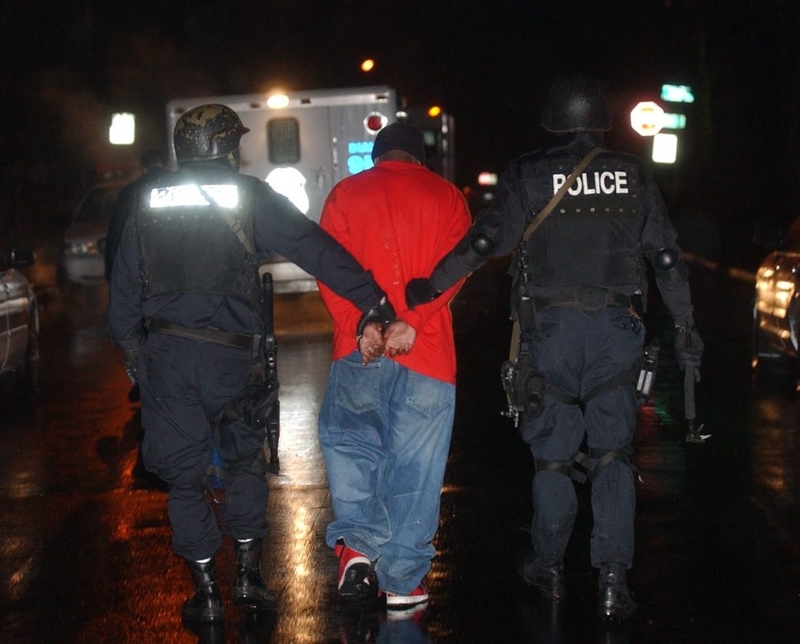 Members of the Niagara Falls Police SWAT team bring out a drug suspect during a raid in 2005. A specially outfitted armored vehicle will allow officers increased protection when accessing crimes in progress. NIAGARA FALLS – The Niagara Falls Police Department’s 19-member Emergency Response Team, also known as ERT or SWAT, are the city’s elite – a highly trained unit called upon regularly to handle potentially volatile situations. But Police Superintendent E. Bryan DalPorto says they were lacking the proper equipment, which must be updated on a regular basis. Most importantly, they needed an armored vehicle. The commander of the ERT unit is Capt. David LeGault and the deputy commander is Lt. David Cook. “It also incorporates two snipers – if we need them,” DalPorto added. DalPorto said the department is constantly attempting to upgrade equipment to be prepared for these emergencies, but when the city was strapped for cash awaiting its casino revenue, it had to hold back on some needed updates. “They work under such dangerous conditions. We want them, as a city, to have the most advanced equipment,” said DalPorto, noting that since the Falls is an international border crossing, it needs to be prepared for cases of terrorism at the bridges. In the Police Department’s 2014 capital budget, more than $400,000 will be spent on upgrading the unit, including new bulletproof tactical vests and a $250,000 specially outfitted armored vehicle, which has been ordered and will arrive in eight months to a year. DalPorto said this will be the city’s first armored SWAT vehicle. Up until now, the department has had to rely on the Niagara County Sheriff’s Office, which is a half-hour drive away. “These situations are fluid and if we need this at the bridge or at a school, half an hour doesn’t cut it for us,” he said. DalPorto said the shelf life on a SWAT vehicle is 15 to 20 years. He said the department is well trained and an experienced ERT is already called upon to assist other communities in Erie and Niagara counties, as well as the Drug Enforcement Agency and Federal Bureau of Investigation. Cook said the standard armored SWAT vehicle, which includes armored windows, also will offer protection from improvised explosive devices and will have the capacity to detect for explosive gas and radiation, as well as a detachable ram unit, which will assist in reaching doors. “In different situations – when someone is threatening to shoot you – you can get to the front of the house,” Cook said of the vehicle. LeGault said there have been a number of situations where officers wish they had had an armored SWAT vehicle. LeGault said that last year, shots were fired at officers and citizens at a large gathering in a city nightclub. He said the people being shot at, both police and citizens, were pinned down until they could fully evacuate. “In a similar situation, we would have that truck available where we could get over to them and get them out much more safely,” LeGault said. He said that in a past hostage situation, the unit had to get a mother and a child out of a house, but had to put them into harm’s way to lead them away from the house. The new ballistic tactical vests for ERT and narcotics officers, who also execute search warrants and quick entries, are upgraded vests with more protection for the arms, shoulder, groin and throat. In addition, they have purchased a hostage-negotiation phone, which is more durable and advanced than a cellphone, and can be thrown through a door or window where a person is barricaded, allowing police immediate contact. Other new items being purchased for use by the detective bureau are an updated lie detection system and new facial recognition software. “When you see those obscure pictures on the news where nobody can make out the face – this has a database of facial recognition features and we are better able to put together suspects from those pictures,” DalPorto said of the new software. He said the department also will purchase an explosive/gunshot residue tester, a handheld device that immediately detects gunshot or gunpowder residue in an area or on a person.